I went to watch “Rustom” for reasons of sheer nostalgia. I just had to see how the “Commander Nanavati case” had been portrayed on screen 57 years after it had actually happened. My late father Ratnakar Hari Kelkar, a retired postmaster, used to take keen interest in legal matters and court proceedings, and the Nanavati case of 1959 was his favourite. It was then the hottest topic of conversation in our home. I was a college student, but I had become familiar with the names of Sylvia Nanavati, the wife, and Prem Ahuja, the lover who was shot. Not only that, I even knew names like Karl Khandalavala, Nanavati’s lawyer, and Ram Jethmalani, the prosecution lawyer, and all their arguments. In those days, the Bombay courts used to have a jury like in Perry Mason’s novels, and the actual setting itself was in a sense “filmy”! So I saw “Rustom” and was, frankly speaking, impressed by its authentic recreation of the Bombay of 1959 and its courts. There was a very realistic interior shot of Bombay GPO, especially the huge circle of service counters located right under its massive dome. My father would have loved to see it! And midway in the movie, it was there – the unexpected sharp shower! Vikram Makhija (actor Arjan Bajwa) is entertaining Cynthia Pavri (actor Ileana D’Cruz) in the sprawling lawns of his home. Suddenly there is thunder and lightning. Vikram says, “Lagta hai bin mausam barsaat hone wali hai.” And bang on, it really begins to rain, the unseasonal “Avakali Paus”! Cynthia is drenched and trips while hurrying to safety. Of course, Vikram has to carry her to his bedroom and the rest follows. So that was “Rustom”, a crime-courtroom-love triangle, complete with the rain sequence that Hindi movies must have! But honestly, I liked it! A new Bollywood Hindi Movie titled “Monsoon” is all set for release shortly this year (2015) under the banner of Mango Movies. It is produced by Mahendra Dhariwal and Jitender Gulati and directed by Suzad Iqbal Khan. The film will have an all-new cast of Srishti Sharma, Sudhanshu Aggarwal, Shawar Ali, Vijay Singh and Raja Gulati. “Monsoon” is a story of the coming of age of a teenager who falls in love with a much older married woman, whose husband dies while on duty as a forest officer. The film revolves around the boy’s dreams, fantasies and feelings towards her. The music has rhythm and romance, and the tunes are catchy. Why is the film titled “Monsoon”? Perhaps because it is difficult to predict its success! 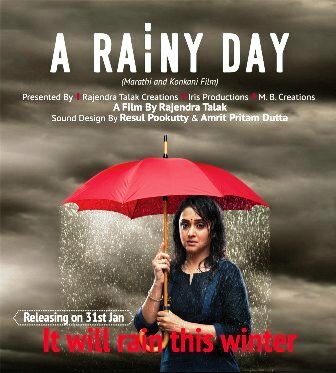 “A Rainy Day” is a Marathi film with an English title. I was curious to know what it was about; so I went to see it first-day-first-show. Aniket (Subodh Bhave) is a successful man, and Mugdha (Mrinal Kulkarni) is the woman behind him. However, Aniket is not only successful; he is ambitious, corrupt and ruthless. Mugdha is honest and has her own set of values to live by. The film is basically about of Mugdha’s sruggle with herself. It is on a rainy day that things which were supposed to be secret get revealed one by one in a bizarre way, but at the end she finds liberation. “A Rainy Day” had to have rain and a lot of it too. But for once, the rain felt real and authentic. The sound was particularly real. One could hear thunder as if it came from outside the theatre. And one could feel and hear the rain as if it was raining inside the theatre. The skies looked really grey. One could imagine being in the driver’s seat, the windshield wipers working hard, and yet unable to see much beyond. And one tried to light a candle on the grave while it poured incessantly. And one was really walking slowly in the rain without an umbrella. The entire film was rain-soaked as every important event was accompanied by rain of appropriate intensity. “A Rainy Day” surely makes you think about many things. Like why do you wait for the monsoon eagerly every year? For meeting your needs of drinking water, for raising crops, of course. But after watching “A Rainy Day” you feel that you need the monsoon for an annual cleansing of the sins of the body, soul and spirit.